King Offa ruled Mercia for 39 years, from 757 until his death in 796. His kingdom covered the area between the Trent/Mersey Rivers in the North to the Thames Valley in the South, and from the Welsh border in the West to the Fens in the East. He also controlled Kent, Sussex, East Anglia and Lincoln; He was, therefore, in effect an early King of England. He was one of the most powerful kings in early Anglo Saxon England, and probably the most famous of the Middle Ages. King Offa was a brilliant soldier, suppressing any resistance from the smaller kingdoms around Mercia. He was also a clever statesman, politician and organiser, being fair and kind-hearted in everything that he did. The wealth and security he created had great influence, socially and culturally, on the English people. King Offa’s fame was widespread; he earned the respect of many European kings, and influenced political affairs all over Europe. 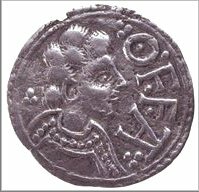 His most notable achievements were his establishment of a new form of coinage that influenced the design of English currency for many centuries and the earthworks, known as Offa's Dyke, that were built to mark the border between England and Wales. It is an indication of King Offa's power that he was able to raise sufficient manpower to complete these enormous earthworks, which stretch for 70 miles and are still, in places, two and a half meters high and up to twenty meters wide.